The elite often gained their wealth from the ownership of gold mines and farming lands. Therefore, they typically lived outside of the villages and towns, and travel was a common element of daily life. Both men and women rode horses and mules, as well as utilizing human-powered vehicles. Wheeled vehicles, such as coaches, were not considered efficient in such a hilly landscape. from Koster, Henry. Travels in Brazil. London: Longman, Hurst, Rees, Orme, and Brown, Paternoster-Row, 1816. The Portuguese adopted the use of the Native American hammock and added a curtain to protect the person within from the sun and rain. Hammocks were used both for sitting and sleeping within the home, and as a mode of transportation. Hammocks were abundant in elite homes in Minas Gerais. from Julião, Carlos and Lygia da Fonseca Fernandes da Cunha. Riscos illuminados de figurinhos de brancos e negros dos uzos do Rio de Janeiro e Serro do Frio. Rio de Janeiro, 1960. 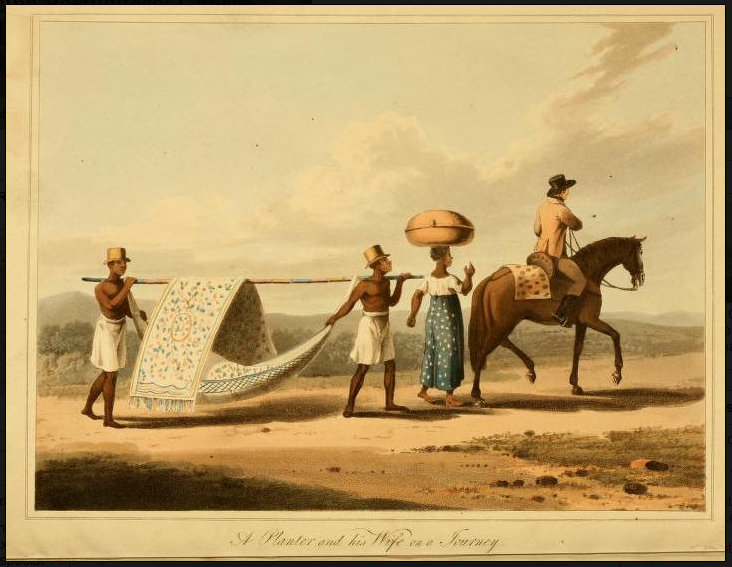 This image is a facsimile of a watercolor painted by Carlos Julião in the late eighteenth century. 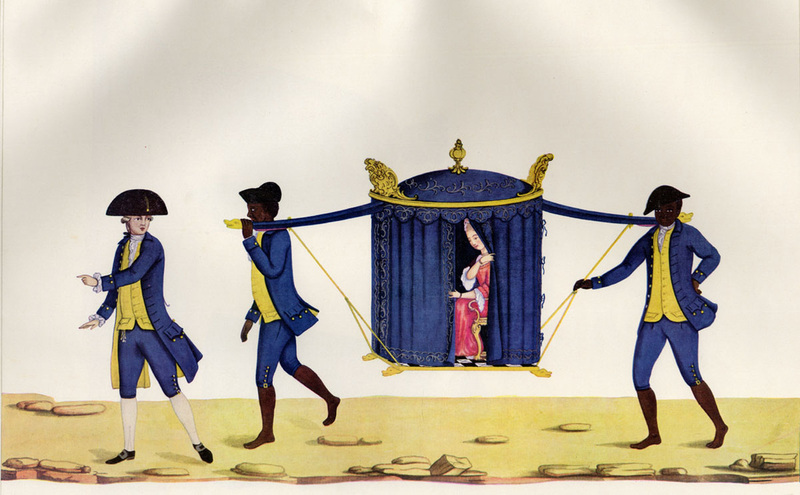 It depicts a cadeirinha, the type of sedan chair most commonly used in Brazil. The cadeirinha was composed of a chair on a platform surrounded by curtains. Cadeirinhas were quite rare in Minas Gerais.